Do you carry a dive knife? Well, believe it or not they can be/are an essential part of diving safety. Case and point … What looks like a routine dive for this pair of divers kind of takes a turn for the worse. Somehow they managed to get tangled/entangled in their dive flag float line. Luckily this happened early in their dive. It looks somewhat comical, but things happen. Fortunately, they were carrying a dive knife and were able to cut themselves loose. They were well prepared with the dive knife, but where was the line reel to better manage the float line? 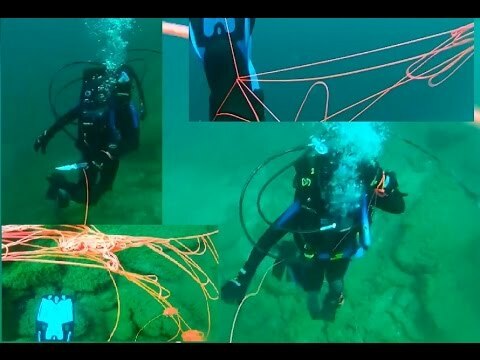 Watch how this entangling scenario played out for these divers in their video below. See next page below for a video explaining how to properly tow a dive flag and manage a dive flag float line.